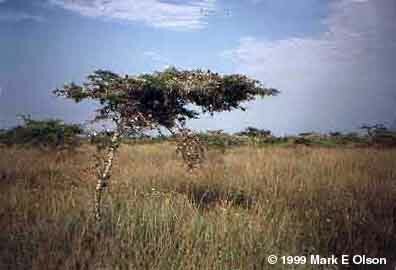 If you throw a stick anywhere in the dry tropics, chances are it will hit a member of the Legume Family. Chances are the stick is from a legume, too. The Legume Family is by far the most important family in dry tropical habitats both in terms of species diversity and number of individuals. The family is of enormous economic importance for food, fuel, fodder, and other products such as gums (locust bean gum and guar). 1. 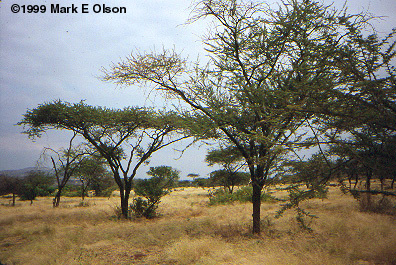 Acacia trees in the Rift Valley near Lake Magadi in southern Kenya. 2. 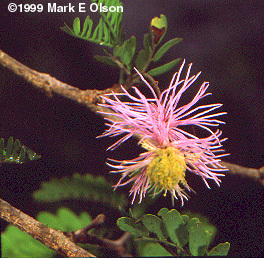 Acacia sp. in Michoacán, Mexico. 3. 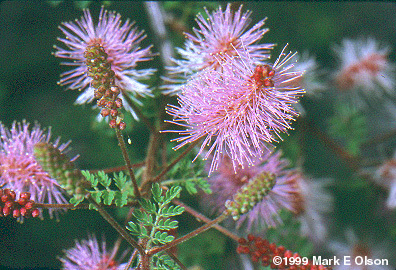 Dichrostachys sp. 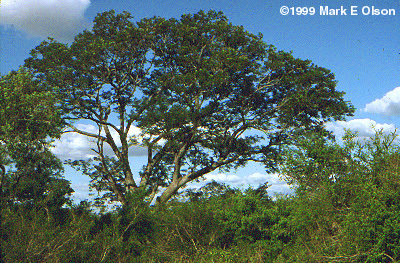 in the Mikea Forest of western Madagascar. 4. Calliandra sp. in central Puebla, Mexico. 5. Enterolobium curvisiliqum in northern Argentina. 6. - 8. 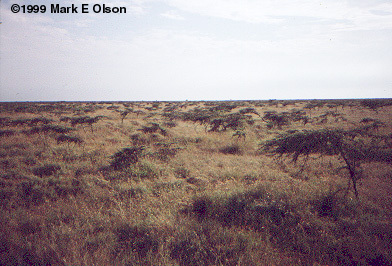 Acacia drepanolobium on the Laikipia Plateau in central Kenya. 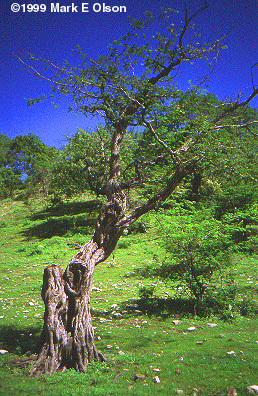 6. and 7. show examples of the extensive stands this species commonly forms. 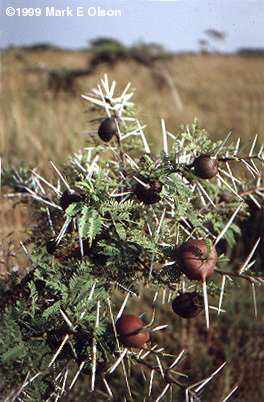 8. shows the swollen thorn bases that are inhabited by ants. 9. 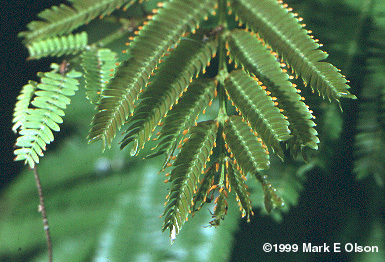 Acacia cornigera is another species of Acacia that hosts ants in hollow thorns. The photo shows a few ants on the leaves. 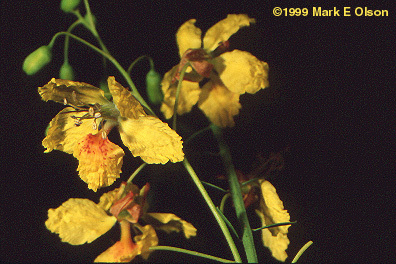 The orange bodies on the leaflet tips are packets of carbohydrates the ants collect and eat. The knobs on the leaf axis secrete a sugary liquid that the ants drink. This species was photographed in coastal Guerrero, Mexico. 10. 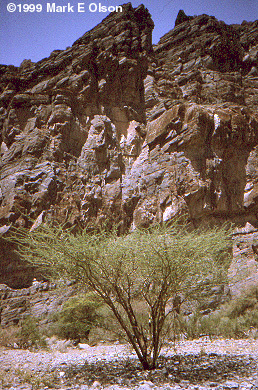 Acacia tortilis in northeastern Oman. 11. Cassia sp. in central Mexico. 12. 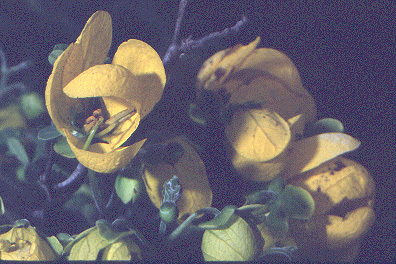 Parkinsonia aculeata photographed in Hidalgo, Mexico. 13. 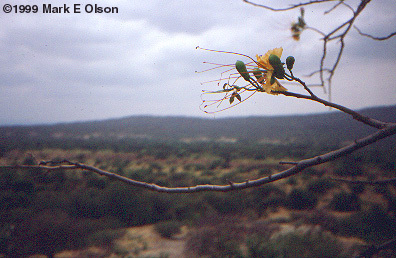 Caesalpinia in southern Puebla, Mexico. 14. 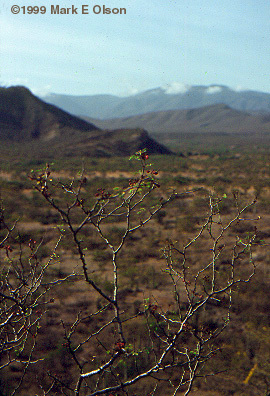 Delonix elata in the Rift Valley in southern Kenya. 15. 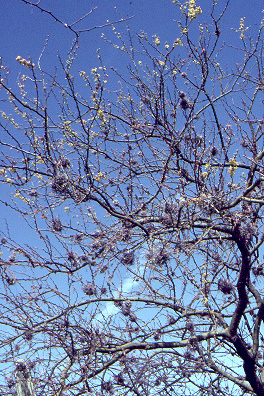 Cercidium praecox leafless and in flower in southern Puebla, Mexico. The dark tufts on the branches are the epiphyte Tillandsia stricta. 15. Coming soon... papilionoids are very common in the temperate zone but less important in the lowland tropics.